Threats to peace and safety can arise anywhere in the world and come from many different sources. As governments and private entities struggle to improve infrastructure and maintain order, having the ability to assemble a skilled workforce in any country becomes crucial to effectively control emerging dangers. TMC Global Professional Services (TMC) has built its reputation providing government and commercial clients the expertise and functional support they need to successfully accomplish missions in challenging environments throughout the world. With operational experience in more than 80 countries, our flexible international workforce of multidisciplinary professionals is prepared to provide a wide range of program management and technical services. 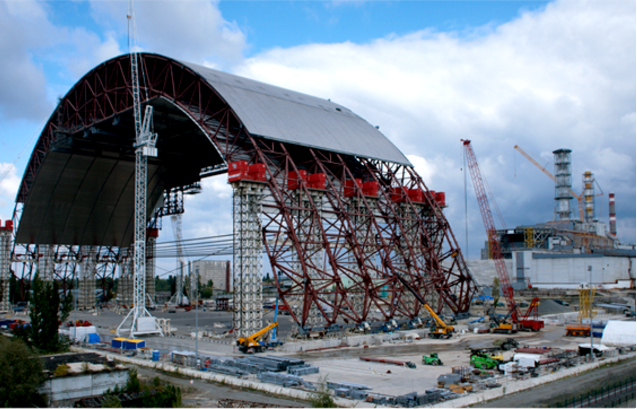 Caption: The Chernobyl New Safe Confinement (NSC) structure will ensure that the site of one of the worst nuclear disasters in history is stabilized and will pose no ongoing threat for future generations. The massive steel arch is 110m high, 165m long and a span of 260m. It is being constructed adjacent to the reactor so that it can be delicately pushed on Teflon pads to cover the temporary shelter that was built after the accident and entomb the radioactive remains of the reactor. Once in place the ends of the arch will be closed permanently to protect the environment from radiation releases and provide the infrastructure to support the deconstruction of the shelter and nuclear waste management operations. TMC has worked in Ukraine since 1995 where it has provided labor and other business support services for Western companies doing business in Ukraine for more than two decades. On behalf of several Western companies, TMC has recruited and employed more than 750 Ukrainian workers with skills ranging from secretarial to engineering, science and heavy construction. This workforce has been utilized on critical and complex projects that range from a massive nuclear confinement project in Chernobyl to WMD and non-proliferation projects throughout the region. Projects like these require extensive cooperative work with local governments and include working closely with several Ukrainian organizations such as the Ministry of Internal Affairs (MoIA); National Guard (NG); Ministry of Energy and Coal Industry (MoE); and the State Nuclear Regulatory Inspectorate of Ukraine (SNRIU). To be effective, TMC leverages an extensive understanding of the cultural and geopolitical issues and utilizes a management approach that is a key component to our success. It is rooted in our Quality Management System (QMS). Our project and program management team has created solutions to mitigate operational risks and challenges that are consistently present in Ukraine. From managing an average of 500 task orders per year, to implementing counter-terrorism and counter-narcotics surveillance systems, TMC gets the job done in Ukraine with a 100% success rate. The 1986 Chernobyl Unit 4 catastrophe remains among the worst accidents in the history of commercial nuclear power. Efforts to contain radioactive contamination caused by the explosion and fire at the location began immediately after the disaster. The shelter, or “sarcophagus” that was hastily built around the reactor in 1986 deteriorated over time and continues to pose a threat to both humanity and the environment. The Chernobyl Shelter Fund (CSF) was established by the European Bank for Reconstruction and Development (EBRD) in December 1997 with the purpose of funding the Shelter Implementation Plan (SIP). The main objective of the SIP is to determine and implement a plan to convert the increasingly unstable shelter over Unit 4 into an environmentally safe and secure solution. The Project Management Unit (PMU) manages the SIP project and is an integrated team composed of experts from Chernobyl Nuclear Power Plant (ChNPP) and Bechtel National Inc.
As a subcontractor to the SIP-PMU management consortium, TMC has been providing the majority of local national staff (currently 102 full-time employees) working for the SIP-PMU in Slavutych, Ukraine and at the ChNPP site within the Exclusion Zone itself. TMC has provided the associated recruitment, human resources management, logistical, and program support functions to SIP-PMU for over fifteen years, beginning in 1998. TMC ensures that all Ukrainian national labor regulations are satisfied, with particular emphasis on the stringent and specialized requirements of the sensitive and hazardous Exclusion Zone around Chernobyl. TMC provides the recurring specialized safety and health training that is required for all personnel working on the Chernobyl SIP and ensures PMU’s general regulatory compliance by staying abreast of all licensing and certification requirements. Additionally, TMC has provided logistical support for the local national employees supporting the SIP-PMU project, including travel, meetings, accommodations, and language support. TMC’s Ukrainian engineers and other technical experts provide first-hand technical and local national regulatory knowledge of the Chernobyl facility at every stage of the implementation, including the New Safe Confinement (NSC) Conceptual Design phase. In addition to our success in Ukraine, TMC has effectively executed WMD and non-proliferation projects over the past 20 years in several Former Soviet Union (FSU) countries including Ukraine, the Republic of Georgia, Russia, Azerbaijan, Uzbekistan, and Kazakhstan. TMC has also implemented numerous border security solutions across the globe. TMC has been awarded two task orders under the Defense Threat Reduction Agency (DTRA) Cooperative Threat Reduction Integrating Contract II (CTRIC II) for the Ukraine Nuclear Security Engagement and the Georgia Land Border Security Project. Work in Georgia will focus on the renovation and construction of border facilities. TMC project staff will support the design, construction, demolition, renovation and and commissioning of facilities with the ultimate goal of improving the command and control, WMD detection, surveillance, and interdiction capabilities of the Georgian Border Police (GBP). TMC will leverage its local Georgian office and significant in-country presence to successfully deliver these projects. With operational experience in more than 80 countries, including strong roots within Central Asia and the countries of the FSU, TMC’s flexible international workforce of multidisciplinary professionals has provided a wide range of program management and technical services to both government and commercial clients. Our work in Ukraine is a shining example of a proven approach to providing international management solutions. Our ability to navigate customs, language, geography, as well as local laws and regulations has helped businesses and government agencies tackle persistently difficult tasks and produced consistently successful outcomes.